Up until the end of July the only sawflies I'd found were caterpillars, but I ended up in an identification mess when the first adults emerged, rather negligently putting them down as soldier flies. Among other things the antennae of the sawflies look very different from those of soldier flies. Having finally identified Rose Sawfly (Arge ochropus) and Berberis Sawfly (Arge berberidis) found among the insects on flowering fennel during mid-August, I went back and realised I'd had adult Large Rose Sawfly (Arge pagana) during July, perhaps hatched from the caterpillars I correctly identified back in early July. Rose and Large Rose Sawflies look a bit similar, but the former has distinctive black & white "football socks" on its legs. Including #159 Lesser Willow Sawfly (larvae on willow tree) I only recorded four species of sawfly since June, which means as there are 600 species in UK, I should be able to find many more - even if it means waiting for next summer. This looks like a shiny kind of wasp taking a rest in the veg plot, but after some book-work I reckon it's a Figwort Sawfly (#278). Working out the identification is quite difficult as there are several other parasitic wasps and wasp mimicking nomad bees and hoverflies that look pretty similar. 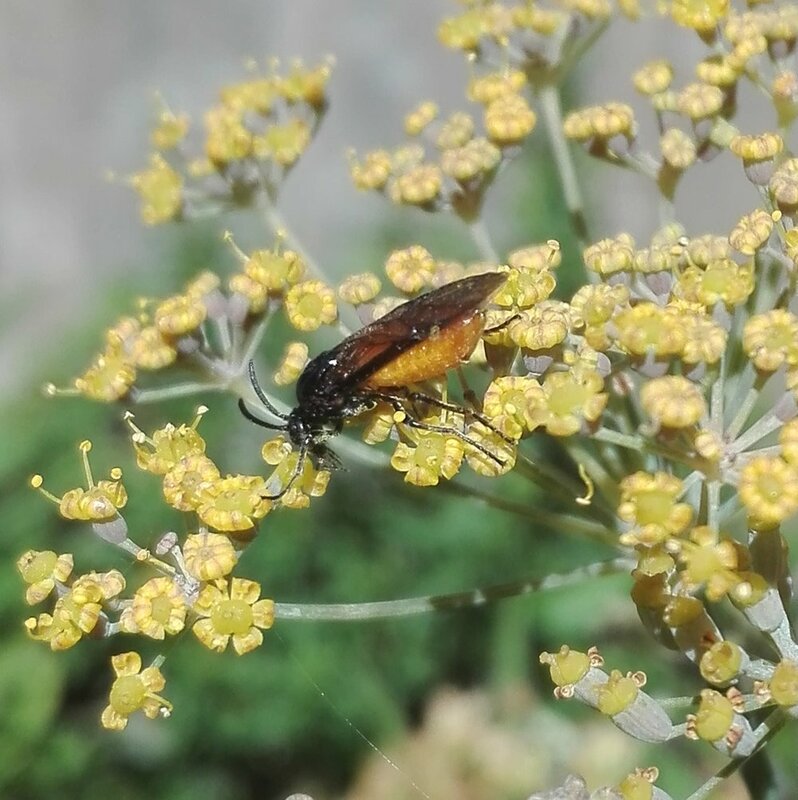 This sawfly’s larvae live on the figwort plant, while the adults hunt smaller insects.